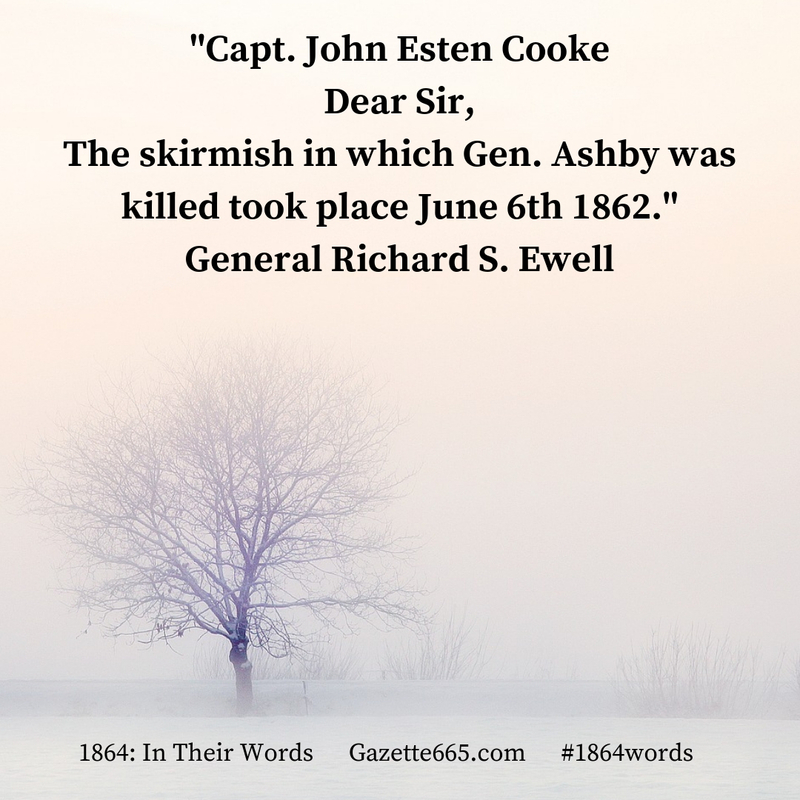 The skirmish in which Gen. Ashby was killed took place June 6th 1862. My Division, acting as rear-guard, had encamped on the evening of the 5th, two and a half miles from Harrisonburg on the road to Port Republic, and Ashby’s Cav. as I understood, had stopped just below the town. Next morning Gen. Geo. H. Steuart’s Brigade was my rear-guard, & the road being bad, had hardly left camp by noon. Gen. Ash by became engaged with the enemy’s Cav. during the morning & about 3 or 4 P.M. had a very successful affair, with a superior force, capturing Sir Percy Eyndham, Col. 1st New Jersey Cav. & thirty or forty & driving their Cav. from the field. About half an hour afterwards (i.e. about 4 1/2 P.M.) Gen. Ashby sent to request Gen. Steuart (who had instructions to give him any support he might require) to furnish him two or three Infantry Regt., as he thought he could strike s blow to advantage at some Infantry the enemy had brought up. The 58th Va. & 1st Md. Regts. were at once started back, & I returned with them. Gen. Ashby pointed out the position of the enemy who were along a fence at the edge of the wood, with a field in their rear. The 58th Va., a small Regt., was formed and advanced through the woods until checked by a very heavy fire from the enemy, advantageously posted. Finding that this small force was making no impression on the enemy, I hurried up the Maryland Regt. & directed it to charge them in flank. The move was gallantly executed, & they were driven in confusion across the field in their rear, exposed to a most deadly fire from our men. The enemy turned out to be the “Buck Tail Rifles,” a large & crack Pennsylvania Regt. of sharpshooters. Lt. Col. Kane, Com’g. them, was wounded & taken; his Adjutant & several others were also taken. The fight lasted about fifteen (15) minutes, in which time our two Regts. lost 60 killed & wounded. The enemy’s lost way much heavier. Just as the Md. Regt came up, & our line began to advance, Gen. Ashby, who was in front of the 58th Va. cheering the men forward, had his horse killed under him. He sprang to his feet & kept on, but had scarcely got ten paces from his horse, when in the act of turning to urge the men onward again, he was struck in the body by a rifle-ball. He fell instantly & died in a few seconds. His body & the equipments of his horse were brought off. The horse was a small bay, borrowed I think from Capt., now Col. Willis (12th Ga. Inf.) & was the same on which Gen. Jackson was wounded at the 1st Manassas, where the horse was also wounded. You might be puzzled… This series is supposed to focus on 1864, and today’s letter excerpt – although written in 1864 – focuses entirely on a skirmish in 1862. Did I go crazy? Nope. There’s a method to my madness! In the winter months of the Civil War, many generals officers finally sat down to write battle reports or catch up on correspondence. This particular letter was not a report; rather, it is private correspondence in an effort to record history. 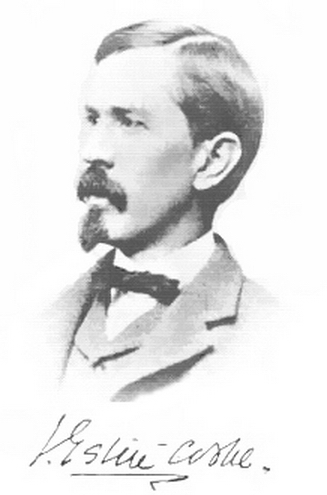 Captain John Esten Cooke had written several novels and numerous short stories prior to the war and joining the Confederacy. Promoted and serving on the cavalry commander J.E.B. Stuart’s staff, Cooke’s writing abilities were often employed by his general for official reports or letters. However, Cooke had his own interests and correspondence, too. 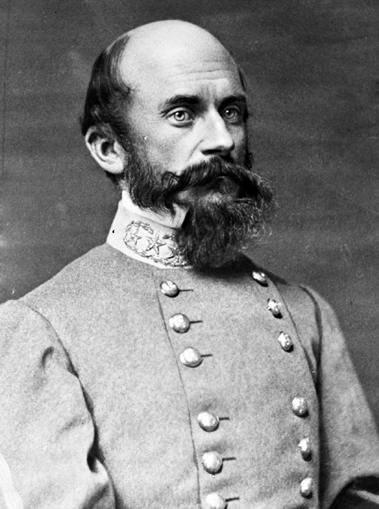 In 1863, Cooke published one of the first biographies of the Southern idol, “Stonewall” Jackson. And he had more books in mind. Cooke wanted to know details. He wanted to hear the accounts from the men who had really been there. Ewell’s letter seems to be in response to one received from Cooke, asking for details about Jackson’s cavalryman death and the battles of Cross Keys and Port Republic. And one winter’s day, Ewell, who at that time commanded the Second Corps of the Army of Northern Virginia, found time to sit down and outline the account for the intrepid story and history writer. We usually think of the historical documents – primary sources – written during the war as the “war record.” But…on both sides, politicians, officers, soldiers, and civilians were hard at work creating secondary sources – usually with an agenda of some sort. And they were writing for publication. Newspapers and book publishers rushed to print these stories or accounts complied from eyewitness accounts or original primary sources, adding their own angle to the facts. Sure, there’s lots to learn from these secondary sources created during the era – especially to study the attitudes, propaganda, and hero worship that occurred even before the war was over. At some point, Cooke seems to have asked Ewell to tell his story of those incidents in June 1862. And we all got lucky and got General Ewell’s primary source account of General Ashby’s death and other happenings during the Shenandoah Valley Campaign. Think about it. Sure, there’s the official reports, but as researchers and history buffs we are lucky that this letter exists. Maybe the lesson of the day is: just ask. Ask grandparents or parents about their experiences, their history. Talk to friends and you might be surprised to learn their backgrounds. Don’t forget to write or tell your own story. We are going to need more primary sources someday, and sometimes the creation begins when someone just asks!